Automatic lab released a new version of OBD2 adapter. It is 3rd generation of the adapter from the company. It’s called Automatic Pro. A part of an adapter is now gold in color instead of silver in the previous versions. 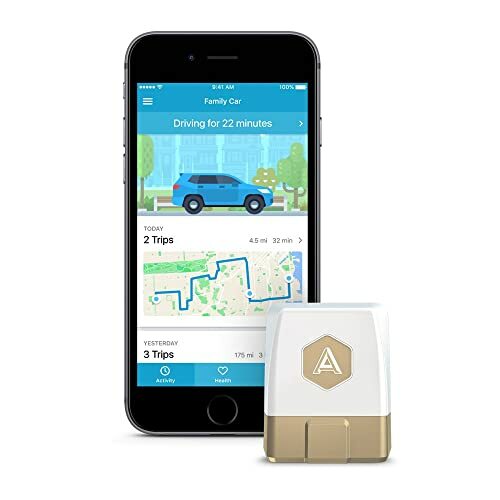 The OBD adapters from Automatic lab has been focused on vehicle tracking and logging, and the new adapter continues to be the same. But the biggest difference from the previous ones is that it uses 3G network. The first generation of the adapter was released a few years ago. It is compatible with iPhones only. Then the second generation adapter became compatible with Android, too. The 2nd gen also supports selected 3rd-party apps. It has built-in GPS. However, you can’t watch real-time data (map, miles, duration, etc) while you’re driving. Although the Automatic app is always working in background, it’s just saying “Currently Driving….” While the app displays nothing but “Currently Driving….” it’s getting all info like miles, speed, fuel level through the adapter and sending it to Automatic Cloud. After an end of a trip (turning off your car), the app retrieves and records this data in the app so you can see it. Thus, you always need your smartphone in a car during a trip. And smartphone has to have a data connection, not tablet or iPad without a data connection. According to the company, the adapter can store up to 8 hours of driving data in case that you forget to bring you phone. So, next time you bring your phone to your car, the previous trip can be retrieved. On the other hand, Automatic Pro mostly relies on 3G Network. As long as the adapter is plugged into the OBD port and within an area of 3G network, you can have access to driving data from anywhere. Automatic Pro mobile app tracks a car whether or not your phone is in the car. You may want to how someone else is driving your car at home. Unlike cellphone plans, the company doesn’t charge a subscription fee. And Automatic Pro app is free to download. All you need to pay is $129.95 (<-regular price) for the adapter. Before you buy the adapter, you might want to know a few things. First off, Automatic Pro currently doesn’t have all features that 2nd gen has. Drive Store, Business Trip Tagging, Fuel Level Report: these features is not available with Automatic Pro right now. The company wants to take time to evaluate these features by getting feedback from Pro users so they can understand which feature users miss most. So, it’s possible that they add features later on. The adapter uses 3G network, but it is still Bluetooth device. According to the company, it works best with Bluetooth on although it can work without Bluetooth and smartphones. To lock in on GPS points sooner, it also uses the phone’s GPS. As 2nd gen adapter supports, Automatic Pro can also use 3rd party apps. DashCommand and Harry’s Lap Timer are iOS only. OBDFusion works with both Android and iOS. There are some new (but minor) features available in Pro version. Automatic Pro app works with Pro adapter only. Pro and non-pro, they are different apps. Even if you are a user of 1st or 2nd gen adapter, you must go through a setup in Pro app with Pro adapter. If you use IFTTT, you must create recipes through Pro app. Automatic Pro (as well as previous versions) is for those who need to track and log trip data. If you share your car with many people, it will come in handy. They do things automatically and work in the background. That’s great. However, $130 is a little pricey. Personally, I have used 2nd gen. It misses trips from time to time. I haven’t reviewed Pro version yet. But if it is truly reliable and never missisng any trips, it’s worth the price.